Pastor Terry Jones' plan to burn copies of the Koran at his church in Gainesville, Florida, let it be emphasized, is a distasteful act that fits an ugly tradition. That said, two other points need be noted: Buying books and then burning them is an entirely legal act in the United States. Second, David Petraeus, Robert Gates, Eric Holder, Hillary Clinton, and Barack Obama pressured Jones to cancel only because they feared Muslim violence against Americans if he proceeded. Indeed, despite Mr. Jones calling off the Koran burning, 5 Afghans and 14 Kashmiris died in protests against his plans. 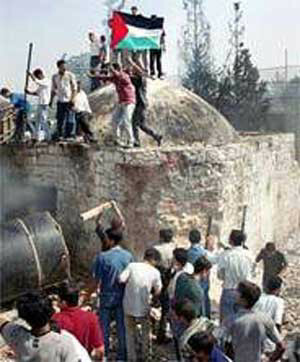 Palestinians desecrated the Tomb of Joseph in October 2000. That violence stems from Islamic law, the Shariah, which insists that Islam, and the Koran in particular, enjoy a privileged status. Islam ferociously punishes anyone, Muslim or non-Muslim, who trespasses against Islam's sanctity. Codes in Muslim-majority states generally reflect this privilege; for example, Pakistan's blasphemy law, 295-C, punishes derogatory remarks about Muhammad with execution. No less important, Shariah denigrates the sanctities of other religions, a tradition manifested in recent years by the destruction of the Buddhist Bamiyan statues and the desecration of the Jewish Tomb of Joseph and the Christian Church of the Nativity. A 2003 decree ruled the Bible suitable for use by Muslims when cleaning after defecation. Iranian authorities reportedly burned hundreds of Bibles in May. This imbalance, whereby Islam enjoys immunity and other religions are disparaged, has long prevailed in Muslim-majority countries. Then, in 1989, Ayatollah Khomeini abruptly extended this double standard to the West when he decreed that British novelist Salman Rushdie be executed on account of the blasphemies in his book, The Satanic Verses. With this, Khomeini established the Rushdie Rules, which still remain in place. They hold that whoever opposes "Islam, the Prophet, and the Koran" may be put to death; that anyone connected to the blasphemer must also be executed; and that all Muslims should participate in an informal intelligence network to carry out this threat. Self-evidently, these rules contradict a fundamental premise of Western life, freedom of speech. As summed up by the dictum, "I disapprove of what you say, but I will defend to the death your right to say it," that freedom assures protection for the right to make mistakes, to insult, to be disagreeable, and to blaspheme. If the Rushdie Rules initially shocked the West, they since have become the new norm. When Islam is the subject, freedom of speech is but a pre-1989 memory. Writers, artists, and editors readily acknowledge that criticizing Islam can endanger their lives. 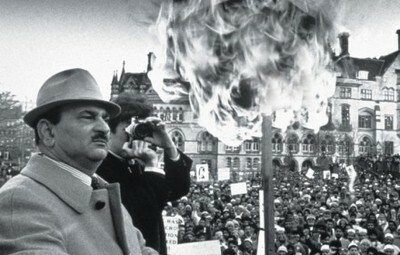 British Muslims burned "The Satanic Verses" in January 1989. Western leaders occasionally stand with those who insult Islam. British prime minister Margaret Thatcher resisted pressure from Tehran in 1989 and stated that "there are no grounds on which the government could consider banning" The Satanic Verses. Other governments reinforced this stalwart position; for example, the U.S. Senate unanimously resolved "to protect the right of any person to write, publish, sell, buy and read books without fear of violence." Likewise, Danish prime minister Anders Fogh Rasmussen stood strong in 2006 when disrespectful cartoons of Muhammad in a Copenhagen newspaper led to storms of protest: "This is a matter of principle," he stated. "As prime minister, I have no power whatsoever to limit the press – nor do I want such a power." Both those incidents led to costly boycotts and violence, yet principle trumped expedience. Other Western leaders have faltered in defense of free expression. The governments of Australia, Austria, Canada, Finland, France, Great Britain, Israel, and the Netherlands have all attempted to or succeeded in jailing Rushdie-Rule offenders. The Obama administration has now joined this ignominious list. Its pressure on Mr. Jones further eroded freedom of speech about Islam and implicitly established Islam's privileged status in the United States, whereby Muslims may insult others but not be insulted. This moved the country toward dhimmitude, a condition whereby non-Muslims acknowledge the superiority of Islam. Finally, Mr. Obama in effect enforced Islamic law, a precedent that could lead to other forms of compulsory Shariah compliance. Mr. Obama should have followed Mr. Rasmussen's lead and asserted the principle of free speech. His failure to do so means Americans must recognize and resist further U.S. governmental application of the Rushdie Rules or other aspects of Shariah. Mr. Pipes is director of the Middle East Forum and Taube distinguished visiting fellow at the Hoover Institution of Stanford University. His article, "Two Decades of the Rushdie Rules" will appear in the October issue of Commentary magazine. 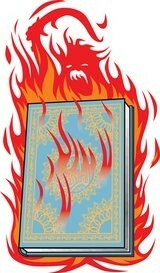 Sep. 21, 2010 update: Two blogs complement this article: (1) an in-depth explanation of the point about using the Bible as toilet paper at "Istinja' with the Torah and New Testament"; (2) points that could not fit the main article at "Further Thoughts on Koran Burning." And a reader points out that Supreme Court Justice Stephen Breyer compared the burning of Korans to yelling "Fire" in a crowded theater. Related Topics: Dhimmitude, Freethinking & Muslim apostasy, Islamic law (Shari'a) | Daniel Pipes receive the latest by email: subscribe to the free mef mailing list This text may be reposted or forwarded so long as it is presented as an integral whole with complete and accurate information provided about its author, date, place of publication, and original URL.